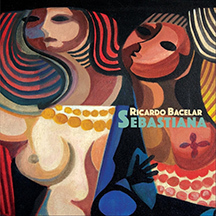 Brazilian Jazz pianist, composer Ricardo Bacelar brings exciting rhythms and a host of talented musicians to his latest project, Ricardo Bacelar - Sebastiana. This sumptuous 15-track release brings together the creative talent of Brazilian, American, Venezuelan, Cuban, Columbian, and Argentine musicians and singers to create a release that is as tasty and satisfying as a bowl of Brazilian feijoada with its delicious mélange of instrumental compositions, and songs sung in English and in Portuguese. Ricardo Bacelar - Sebastiana was produced by Cesar Lemos and recorded in Miami, Florida. For his latest release, Ricard Bacelar assembled an amazing group of top musicians and vocalists from Brazil, Argentina, Venezuela, Cuba, Columbia, and United States, and like the iconic Brazilian culinary recipe feijoada (a black bean and meat stew that varies from cook to cook depending on ingredients and spices used), in the hands of the ensemble, createa delectable musical version of feijoada. This gorgeous 15-track release opens with a stunning instrumental composition, A Volta Da Asa Branca (Return of the white wing), written by Luiz Gonzaga and Zé Dantas. What gives this song its interesting punch is Channo Tierraon acordeón diatónico, which is a button style accordion. Ricardo Bacelar and Cesar Lemos demonstrate their composing talent on another instrumental piece, Suco Verde (Green Juice), then slide into Nothing Will Be As It Was, written by Milton Nascimento, Ronaldo Bastos, and Renee Vincent, where Steve Hinson layers in his pedal steelguitar and American Maye Osoriol ends her beautiful voice to this English language song. Next up is, River Of Emotions another great song written by Ricardo Bacelar, which has a wonderful piano opening that shows Ricardo's talent as an accomplished pianist. Ricardo Bacelar takes the listener to the north of Brazil to the state of Bahia with the 1979 Gilberto Gil song, Menina Baiana (Bahian Girl) with its catchy Brazilian rhythms with Yoel delSoll on percussion. Interesting to note about Gilberto Gil is that in addition to his singer, songwriter, and musician credits, he was Brazil's Minister of Culture for Brazil from 2003 -2008. Next in the line-up is Somewhere In The Hills written by Tom Jobim (Antônio Carlos Jobim 1927-1994), Vinícius de Moraes (1913-1980), and Ray Gilbert (1912-1976). Andrea Mangiamarchi lends her beautiful vocals singing in English, and Anderson Quintero plays percussion. Get ready for a gorgeous piano opening on Partido Alto, (High Party) written by Brazilian Jazz singer Flora Purim, Alex Malhéiros and José Roberto Bertrami, where Jose Sibaja adds a splash of spice with trumpet and flugelhorn. The release segues into another Ricardo Bacelar composition, Parts Of Me, then slides into Sambadouro, a song written by Ivan Lins and Vitor Martins, and sung by Rose Max and Ramatis Moraes. Ricardo Bacelar lends his own wonderful vocals on the song, Oh Mana Deixa Eu Ir (Caicó Cantiga) (Oh Man, Let Me Go) written by Hector Villa-Lobos, Milton Nascimento, and Teca Calazans. Sung in Portuguese, the song is as lovely, slow, and soft as a whisper on the wind. Next in the play list is the title track, Sebastiana written by Rosil Cacalcanti. Gabriel Fernandez layers in the bandoneon, (a type of concertina used in Argentina, Uruguay, and Lithuania) on Depois Dos Temporais (After The Thunderstorms) written by Ivan Lins and Vitor Martins, with Anderson Quintero on percussion. The release continues with Vento De Maio (Winds of May) written by LôBorges and Márcio Borges, where Jose Sibaja plays trumpet and flugelhorn and Jesus "el Viejo" Rodriguez layers in the charango, an Andean stringed instrument, that gives the song an extra special something. Ricardo Bacelar teamed up with his friend Cesar Lemos and co-wrote Sernambetida, 1992, and closes out the release with great style and substance with his own The Best Years. While you may not be taking a trip to Brazil soon you can visit it any time by closing your eyes and giving Ricardo Bacelar - Sebastiana a listen. Websites where you can procure Ricardo Bacelar - Sebastiana: Amazon and cdBaby. Follow Luxury Experience on Facebookat www.Facebook.com/LuxuryExperience to see photos and videos. © May 2018. Luxury Experience. www.LuxuryExperience.com. All rights reserved.